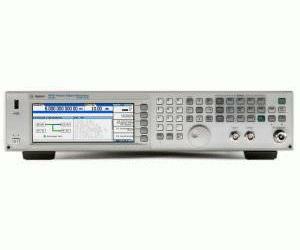 Agilent MXG vector has two frequency range options to choose from to meet your specific RF test and budget requirements. Selecting Option 503 equips the Agilent MXG vector to generate signals in a 250 kHz to 3 GHz frequency range. Option 503 is recommended for test cases that require CW, analog modulated, and vector modulated RF test signals at or below 3 GHz carrier frequencies. This option is ideal for popular communications systems in the cellular and lower ISM frequency bands, such as W-CDMA, cdma2000®, WLAN, and WiMAX. Common signal generation uses include LO and clock substitution, interference generation, and reference signal generation for analog and digital components and receivers.